The tobacco industry is known for being a fast-paced processing and manufacturing environment. Carryline USA works with the majority of snuff manufacturers. Our lines carry everything from empty containers and lids to ready-packed cartons, all of which can be managed on the conveyor line. In this type of industry, the machines must have a full workload at all times and be able to handle it. IMS has a full selection of product buffers, guide rails, traffic cops, diverters, and pushers to keep your products moving. We also have alpine conveyors (also known as accumulators) and spiral conveyors to help control the flow of traffic while keeping things moving, allowing products to build up if extra processing time is needed further down the line. They do this process automatically so you won’t have to worry about backups, and can handle more than one row of products, which decreases their footprint on your factory floor. From packaging of individual tobacco containers to packing cartons to packing them in boxes to palleting for shipping, IMS can help you automate nearly every step of the process. 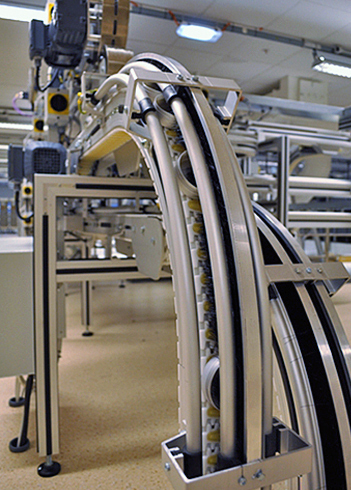 Our conveyor systems and added components are built to handle strenuous work environments so you won’t have to deal with downtime or relying on our technicians. Our conveyor systems are energy efficient and can be powered via overhead power or with a free set-up. We specialize in solutions for taking up the least amount of space on your production floor and our systems integrate well with other systems, work stations, and more. We also offer custom services if you have specialty conveying needs. Contact one of our skilled representatives to talk about how you can save time and money with IMS.